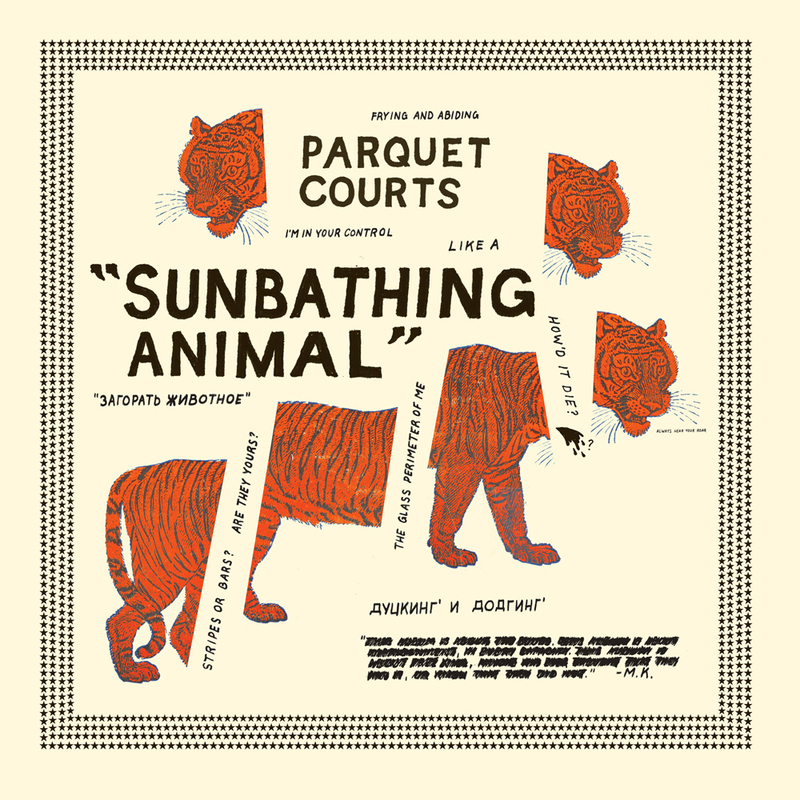 The new Parquet Courts record Sunbathing Animal was officially announced this week, and with it a stream of the titular track and a Best New Track nod from Pitchfork! Of all the songs on the record, this is the one that still elicits the strongest reaction – it really does something for me. Tracking this song is probably the most intense recording experience I’ve ever had – there’s almost nothing in the instrumental to cue where you are in the song and it’s practically un-punch-in-able – and I think that feeling of riding the rails and struggling to finish the sprint is truly captured here. I like to think of it as the sonic equivalent of a beast of hair, teeth and claws bearing down on you as you for dear life. Over the weekend, I listened to the acetate of Sunbathing Animal back to back with the test pressing of the Eaters LP with my other Eater Bob Jones and Andrew Savage from Parquet Courts (who’s co-releasing Eaters on his label Dull Tools). Both of these records mean so much to me (emotionally, creatively, professionally), from the experiences of making them (with people I consider to be both inspiring collaborators and close friends), to the finished albums (and the feeling that I wouldn’t change a single thing about either one). I can’t wait for people to hear what I’ve been doing with the last year of my life. Another labor of love that just hit the internet is the first song from my good friend Gregg Gillis’ new Girl Talk EP with Freeway, Broken Ankles. I’ve been working with him off-and-on throughout this project, and it’s so exciting to see this drop. The first single “Tolerated” has a verse from Waka Flocka Flame, and an Enon sample to boot! Plus, the video is completely ridiculous and amazing. The full EP comes out April 8th on Dat Piff. And I just got my own copy of the Fa Bonx 7″! They exist! There are all kinds of back stories and rumors about the provenance of these recordings… something about a forgotten glam band and rescued tapes… all I know is that Kevin from What’s Your Rupture brought me these tape transfers to work with, and it was a blast doing it. Check out The Rinda below. I’m so psyched to be mixing the new PC Worship record right now! They were the first band I fell for after moving to New York, and I’ve scrambled to keep up with their releases since. This new record, recorded and mangled by primary Worshiper Justin Frye at Roulette, is a massive slab of mutant rock n’ roll that pushes the boundaries of their sound in some stunningly mind-numbing ways. Look for it this fall…. you should be psyched too. I just finished working on a record by Dream Police, a new project from Mark Perro and Nick Chiericozzi of The Men. It’s a trip of a record, heavy on drum machines and wild solos, with a lot of stylistic ground covered – from industrial biker vibes to acoustic psychedelia to cinematic synth-pop and everywhere in between. I co-mixed it with Kyle Keays-Hagerman and the band at Doctor Wu’s, and Kyle tracked it at his space Spice World on his own Otari MX-5050. I’m not sure when or where this will be coming out, but it’ll be a real treat when it does. Next ArticleEaters LP Out Now!